Some higher education institutions have a penchant for the grandiose. Case in point, some libraries were built to functionally be a designated place for students to study. Meanwhile other college libraries are architectural wonders that happen to be where students come to study, visit, share, and relax. While the difference may be small to some, it can be a real game-changer for other students. After visiting a handful of college campuses around the country, you will discover that library buildings can vary greatly. Some libraries may be small and box while others capture the imagination with spacious and artsy architecture. Understanding the differences can have an impact on your college life if a library has the power to inspire a student to spend more time studying or inspire them in some way. As a result of this impact a library can have on students, we have compiled a list of some great libraries at 4 year colleges around the United States that highlight both traditional architecture to modern marvels of construction. 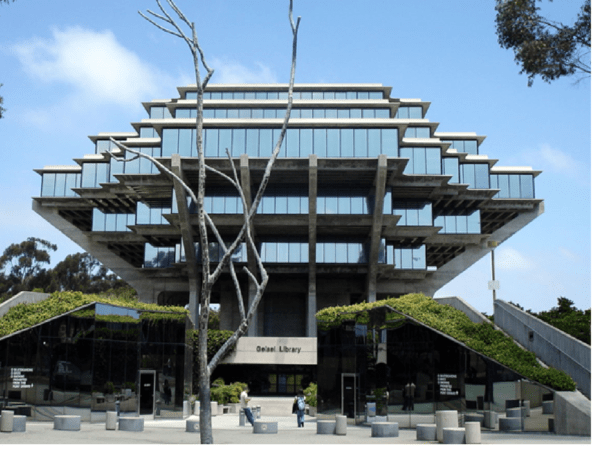 As a sample check out the Geisel Library on the UC San Diego campus named after Theodor Geisel (better known as Dr. Seuss). For many college students, the time spend in a library is substantial. It can be the place where you study and gain confidence in your degree of choice. A library can act as a meeting place between friends or it can be where you meet your future significant other. Every library experience may be different but it will typically be a hub of the school to gather and share time & information. Taking the time to visit a school's library may in fact be a tipping point in your decision-making process given the real and perceived importance of that particular building. Check out the list below of the top rated libraries and schedule a school tour at schools that fit your overall criteria for future colleges.